As a psychiatrist working with people facing many kinds of adversity, sometimes people ask about my own religious beliefs. 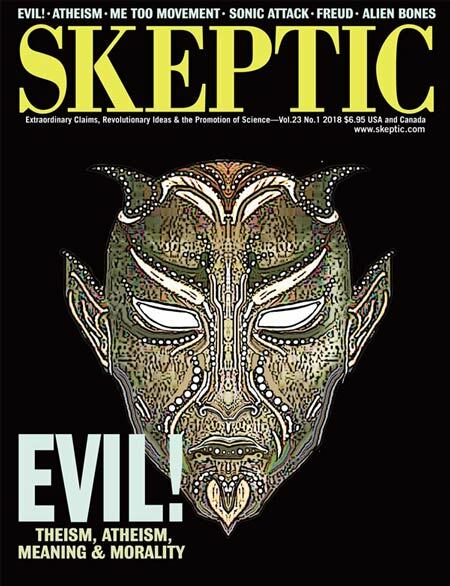 In those cases where it is appropriate for me to provide a frank and direct answer to this question, it is not uncommon for some, especially religious believers, to respond with the question “You’re an atheist?! How do you find meaning and morality in life if there is no God?” What follows is my answer, addressed to a religious believer. The age-old assumption that there must be some sort of higher purpose to life fits with an intuitive human tendency to think that “everything happens for a reason” (and it’s all about us). This assumption has powerful potential to affect motivation— positively or negatively. The belief that life has inherent purpose is a double-edged sword: It can be reassuring and comforting, but can also lead to bitter anguish and feelings of abandonment when suffering cruel adversity (“Why me?!”). In contrast, the realization that life is fundamentally random is anxiety provoking, but liberates people from destructive unfounded self-blame, and the realization that meaning is something we make for ourselves can be empowering. I see how the human tendency to think that events have inherent purpose and to think that such purpose refers to oneself (“everything happens for a reason and it’s all about me!”) becomes magnified ad absurdum in psychiatric disorders: as paranoid delusions in psychosis, grandiosity in mania, and irrational magical thinking in obsessive-compulsive disorder. Many aspects of human nature, and our many cognitive biases, are writ large in mental disorders, exposing the flaws in these intuitions more plainly. Interestingly, there are evolutionary reasons why we all have this tendency to mistakenly overidentify pattern and purpose. To be an atheist is to consciously override these intuitions. Atheists do not believe that life is inherently purposeful or meaningful, and following from this they do not believe that morality is an intrinsic property of the universe. Atheists see the universe as indifferent to the living creatures that have evolved within it. The universe may not be purposeful, but humans are. All living creatures are purposive, in a basic sense. Even a bacterium or a plant is purposedriven. Human purposive behaviour has evolved to become much more embellished, elaborated by conscious intention, but it is fundamentally driven by the same basic unconscious goals of all living things: survival and reproduction. This simple biological fact needn’t diminish our spectacular purpose- driven accomplishments any more than does the realization that the beauty of peacock tails is blindly driven by peacock genes getting themselves copied into the next generation. We are very adept at making meaning, and we usually succeed quite well at doing so, even in the face of severe adversity. Indeed, we often succeed at doing this even more in the face of adversity than we do in times of plain sailing. Believers might attribute this tendency to a God-given strength, but our propensity to ascribe meaning can also be fully explained in evolutionary terms. Regardless of the origin of this proclivity, people somehow find many sources of life satisfaction and meaning, regardless of whether they are religious believers or not. But you’ll no doubt concede that, unavoidably, meaning in life can be hard to find in some life circumstances. You must struggle to explain why bad things happen to good people. Even if you believe that there is some deeper purpose to suffering that defies our human comprehension, and if you believe that perhaps it will all make sense and become meaningful in some kind of world beyond the one we know, there is no escaping the fact that there are situations in which suffering is irredeemably terrible within the confines of this world. For believers, such situations often trigger a painful crisis of faith, in which they feel abandoned by God. For atheists, accepting that life is not inherently meaningful means that in some cases of terrible suffering the reality is simply that nothing meaningful can come from that kind of suffering, and life for the sufferer is indeed meaningless in that situation. (There are situations where, quite rationally and reasonably, death may be preferable to some people rather than continuing to live in futile suffering and misery. In my line of work, examples include some cases of severe terminal cancer. In such cases, I support mentally competent individuals’ right to choose and access painless, rapid medical assistance in dying, when they are ready to “call it a day”.) Still, such situations are generally the exception, not the rule. I have found in my work that most people, whether religious or secular, are actually able to find meaning in their life circumstances, even when these are grim. And most people’s natural instinct and preference is to live as long as possible, despite adversity. We must be cautious about reaching the conclusion too hastily that life is meaningless in particular circumstances, because people often find purpose and meaning in the most unlikely circumstances, to their own and others’ surprise. To be an atheist is to consciously override our cognitive biases and intuitive tendencies that lead us to mistakenly overidentify pattern and purpose. A fundamental source of meaning for you and me, like most people, is knowing that we matter— that our life matters to others, that our life has an effect on the lives of others, and that others care about us. When bad things happen to people, suffering can be partially mitigated if the sufferer has reason to expect that something good might come out of their misfortune—perhaps some positive impact on others. For me, helping people who are experiencing adversity and demonstrating to them that I am interested and that I care about their life not only gives comfort to them but also gives me a rewarding feeling that I am doing something very meaningful. I’m sure this is the case for you too. And if someday you or I find ourselves in a position of suffering, we can hope there will be someone whose empathic instincts lead them to show similar interest in our plight. We have never once been taught by word or act to distinguish between religion and the moral laws on which it has artfully fastened itself, and from which it has sucked its vitality. When we have dragged down the weeds and creepers that covered the solid wall and have found them to be rotten wood, we imagine the wall itself to be rotten wood too. We find it is solid and standing only when we fall headlong against it. We have been taught that all right and wrong originate in the will of an irresponsible being. It is some time before we see how the inexorable “Thou shalt and shalt not,” are carved into the nature of things. You see, religion is not the source of purpose, morality, and meaning. Instead, religion can be understood as having incorporated these natural motivational and social dispositions, and having coevolved with human cultures over time. Unsurprisingly, religion also incorporated our more selfish, aggressive, competitive, and xenophobic human proclivities. You’ll agree that we humans have both prosocial and antisocial traits. Natural selection has shaped us to be cooperative, because this favors survival in social animals. And it has shaped us to be empathic, because this favors mammalian parentchild attachment and more efficient social interaction. Many other natural factors favor prosocial behavior, such as reputation—which plays a crucial role in primate groups. We have also evolved to be competitive and aggressive. As a general rule, people are inclined to cooperate with and care about those within their kin or group, and to compete against those outside the group. There are, however, frequent exceptions: selfish, indifferent and cruel behavior toward those within kin or clan; or empathic and generous behaviour to those outside the group. And there are tremendous interindividual differences in temperament that incline some people to be more cooperative and caring and others to be more aggressive or exploitive. Human societies are increasingly interdependent, which has dramatically broadened the notion of “within-group” and has tended to favor cooperation in modern developed societies. Many other factors in the course of human civilization have tended to favor a gradual decline of violence and a trend toward more civil society. 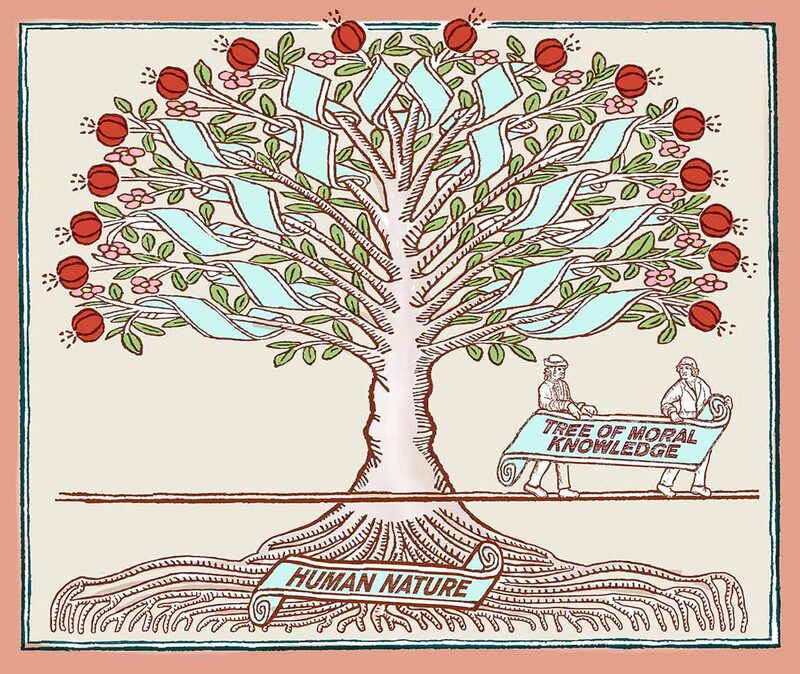 Additionally and importantly, it should be clear that the human capacity for sophisticated reasoning also plays a very important augmenting role in suppressing violent instincts and promoting prosocial cooperation and compassion, contributing to the development of social contracts and increasingly rational systems of law. All things considered, developing more caring societies can be seen to be a realistic, non-naïve collective human project. For me, and probably for you too, working to make our society more moral and compassionate is also a major source of purpose and meaning in life. Societal progress in our modern era has been uneven and faltering; catastrophic derailments have occurred along the way and will always be a risk. But the long-term positive trend toward more compassionate, purpose-driven societies has been strong and unmistakable. Atheists understand that societal ethics and compassion are achieved solely through human action. No gods will guide us.We can rely only on ourselves and our fellow human beings. We have to put special emphasis on strengthening human relationships and building more effective, caring societies based on cooperative inter-dependence. All we have is each other, huddled together on this lifeboat of a little planet in this vast indifferent universe. Ask yourself: Do you want the universe to care, or do you just want people to care? There is a fairly good chance of getting people to cooperate and to care about the lives of others. But expecting the universe to care? Best of luck to those who do…. Dr. Ralph Lewis is a Staff Psychiatrist at Sunnybrook Health Sciences Centre in Toronto, Canada, and an Assistant Professor at the University of Toronto. 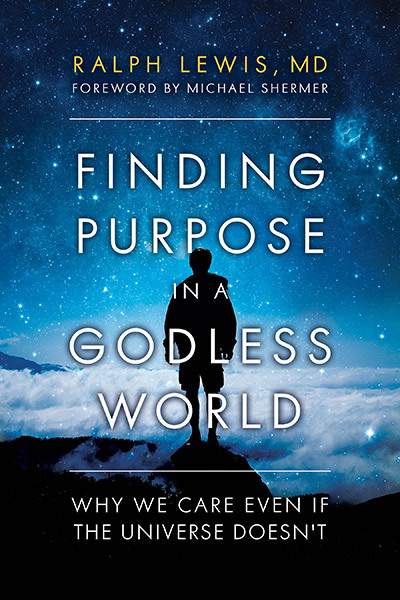 He is the author of Finding Purpose in a Godless World: Why We Should Care Even if the Universe Doesn’t. Dr. Lewis was Michael Shermer’s guest in episode 30 of the Science Salon Podcast. Clearly morality does not come from God. Religion is just “piggy backing” on natural moral laws. Purpose in a purposeless universe: Hmm, isn’t that like ultimately finding good in a world without ultimate good to be found? Right, Dave (#2). “Purpose” is a semantics dissertation. The issue ought to be the examination of various purpose driven behaviors and what good effect human effort has. It comes down to once again just how insignificant we are and how to mitigate this pessimism of materialism/atheism. That is, if lack of belief is any problem at all. They are alike. Both are the work of creative imagination. I prefer “create” instances of purpose and goodness to “finding” them. It’s hard to find a common cognitive thread that ties the headhunters in Borneo to the hedge fund managers on Wall Street, and the Buddhists to the Catholics, and the teenagers to the octogenarians – not to mention the males to the females. We are each unique genes and memes and the sum of our individual histories. I’ve not read his book, so maybe Dr. Lewis has addressed these differences in the context of “purpose.” That would be quite a challenge. Atheism, unfortunately, carries with it a connotation that often says to believers that they are sub-par human beings because they rely on God as a staunch force to guide their faith, hope, and love as they relate to other people abd a higher power, a necessity in believers’ lives. Those who choose atheism are certainly welcome to pursue a life style independent of a ruling God, and will find no reason to trust in this type of absurdity to govern their lives. And yet, there are those atheists who would prosyletize more vehemently to believers and insist they should not believe and are wasting their time embracing absurdities. These latter atheists are none other than scary, the same that shake their heads and wag their fingers at parents admiring their children’s participation in an X-mas pageant or nativity scene as shepherds or wise men. Perhaps ‘non-believer’ is a softer term. Sounds like humanism. Makes sense to me. For sake of discussion, I would say that the universe DOES care, if only for the simple reason that creatures who do care (e.g. human beings) are part of it (the universe). In other words, with the emergence of the human brain, the universe becomes self-conscious and caring – among other properties that emerged in the human brain. What did Stephen Crane write? In response to Jean-Marc: a very intriguing observation! I have read Ralph Lewis’ book and he addresses this point. But though the idea of the universe becoming concsious of itself through the evolution of the human brain is truly amazing , it is not the reason the universe came to be. We are just one of the countless random phenomena that emerged from the Big Bang, a pre-God, pre-religion origin. To me that is evidence enough that the only meaning or purpose there can be is what we create for ourselves, be it secular or religious. If there is to be a purpose, it is entirely up to me (nobody else)to define it. The Universe has no mind. Of the four pairs mentioned, one is religious – “the Buddhists to the Catholics”. I can think of two “common cognitive threads that tie these two faiths (and many others): (1) the subordination of women, as well as well as any on-traditional gender or sexual identity. Neither of these religions – nor most other beliefs – allow women, much less identified GLBY’s, to be clergy; (2) the murders of ‘others’. The Catholic Church had its Crusades, Inquisition, and South America. (“I humbly ask your forgiveness, not only for the offenses committed by the Church herself, but also for the crimes committed against the native peoples during the so-called conquest of America.” [Pope Francis, 2105]). The Buddhists of Mayanmar, according to Amnesty International, the US Department of State, and the UN Human Rights Council, are currently trying to exterminate the Rohinga. Strangely comforting, Ralph Thank you.